The Muscle Car and Corvette Nationals is turning into the one of the country’s premier car shows. 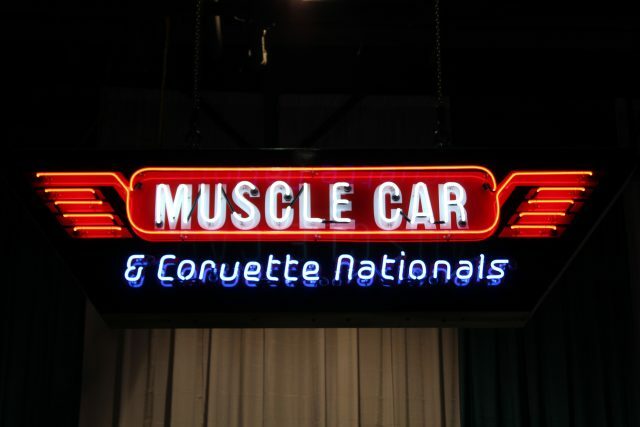 Where else can you see rare and some of the most exceptional muscle cars under one roof? This year marks the tenth anniversary of MCACN and the show didn’t disappoint. Take a look at some of our favorites from this year’s show. It’s good to see AMC was well represented at this year’s show. This stunner in Big Bad Blue is one of only 2,501 Donohue Editions built. It was a one-year only special edition built for AMC’s entry into Trans Am racing. This is another rare piece of muscle car history. Few were built and only 728 got the Stage 1 engine like this beauty. This was one of the few colonnade coupes from GM at the show. Seeing a Corvette L88 is a rare treat. They are some of the most coveted Vettes ever created. And with 540 to 580 horsepower, they are some of the most powerful ever created. Several of the finest of this lineage of muscle car royalty were presented at the 2018 MCACN. Factory drag racers like these Mopars came out in force at this year’s show. These two are some of the finest examples still around today. They earned their reputation a quarter mile at a time. These one-of-a-kind show cars were brought to MCACN in memory of the late Steven Juliano. They were there to welcome spectators as they entered the show. These cars demonstrate the creativeness of the designers from Chrysler during the golden age of the muscle car. The Ford Cougar II was part of Ford’s experimental car collection. This car was first shown to the public at the 1964 New York World’s Fair. A unique feature of the Cougar II was its side windows. The driver adjusted the window’s height by sliding a spring-loaded lever up and down a grooved, vertical track. The Bordinat Cobra was the first coil-spring Cobra and its exterior was formed from Royalex – a material that could bounce back from minor dents. The California Special was a one-year only special edition Mustang designed by Carroll Shelby. However, that’s not what makes this particular Mustang unique. In 1995, this car was shot over 200 times during a domestic dispute. Afterwards, the car spent 15 years sitting outside in Wyoming until it was restored in 2013. This was one of the few trucks that showed up at this year’s show. The present owner found this gem through a craigslist search and paid the original owner $800 for the truck. Hopefully, the next time we see this truck, it will have been treated to a full restoration. This is another one-year only special edition created by Pontiac and Motortown Corporation. Supposedly, Pontiac had orders for 5,000 but stopped production at 1,377. According to Pontiac, the official reason the car was discontinued was because the mold for the duckbill spoiler broke and Pontiac didn’t want to wait for a replacement. The owner of this Can Am stated this was the first Can Am to be featured at the show. The Shelby GT500 EXP prototype, which was thought to be destroyed, was found by Craig Jackson, chairman and CEO of Barrett-Jackson, and car restorer Jason Billups. This is the only GT500 coupe built by Shelby and the only multi-carbureted Mustang ever built. The EXP500 was originally built as a GT/SC and was then assimilated by Shelby as a second prototype. The car was restored to its Shelby Automotive prototype appearance by Billups Classic Cars earlier this year. There are few shows that match the caliber of MCACN one. Everything from barn finds to concours restorations was well represented during this year’s show. If you’ve never attended, you owe it to yourself to check out this show. You’ll be hooked, too.